A computational model of mitochondrial metabolism and electrophysiology is introduced and applied to analysis of data from isolated cardiac mitochondria and data on phosphate metabolites in striated musclein vivo. This model is constructed based on detailed kinetics and thermodynamically balanced reaction mechanisms and a strict accounting of rapidly equilibrating biochemical species. Model-simulated time courses and experimental data on total pyruvate (A), citrate (B), -ketoglutarate (C), succinate (D), and malate (E) are plotted for experiment 1 of “Results”; model simulations and experimental data on total aspartate and glutamate (F) are plotted for experiment 3. For all reactants other than external citrate and total aspartate, experimental data of LaNoue et al. (J. Biol. Chem., 1970) on total concentrations are plotted as shaded triangles, and model simulations are plotted as solid lines. 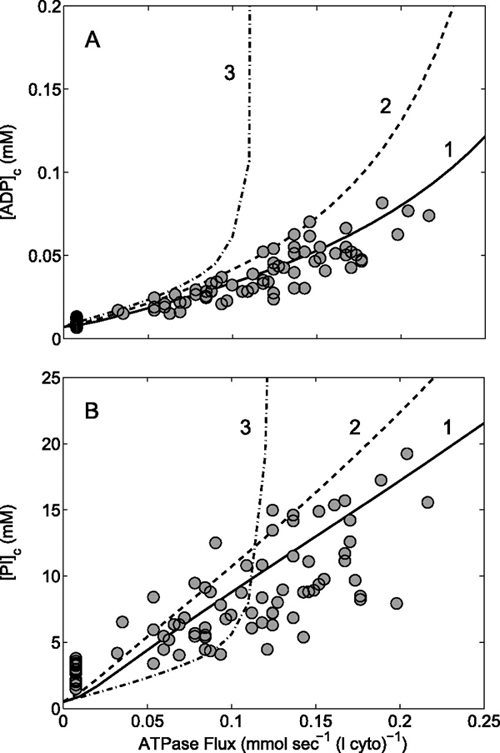 For total aspartate (in F) and external citrate (in B), the measured data are plotted as open circles and compared with model simulations plotted as dashed lines. Details on the experimental and simulation protocols are provided under “Results” in the full text. Model-simulated time courses and experimental data on total pyruvate (A), citrate (B), -ketoglutarate (C), succinate (D), and malate (E) are plotted for experiment 2 of “Results”; model simulations and experimental data on total aspartate and glutamate (F) are plotted for experiment 4. 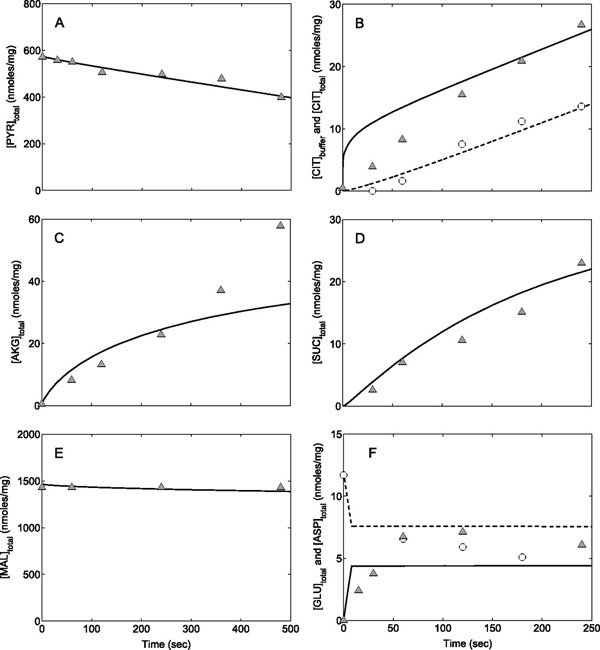 For all reactants other than total aspartate, experimental data of LaNoue et al. (J. Biol. Chem., 1970) on total concentrations are plotted as shaded triangles, and model simulations are plotted as solid lines. For total aspartate (in F), the measured data are plotted as open circles and compared with model simulations plotted as dashed lines. Approximately steady state-3 conditions are maintained throughout the experiment by the presence of ADP, PI, glucose, and hexokinase in the external buffer. Details on the experimental and simulation protocols are provided under “Results” in the full text. A, plot of predicted ADP concentration in cytoplasm, [ADP]c, as a function of ATP hydrolysis rate, ATPase flux. 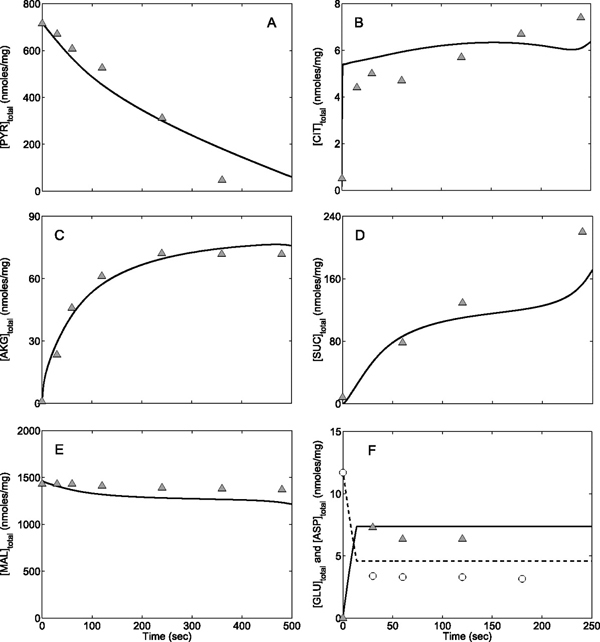 B, plot of predicted inorganic phosphate concentration in cytoplasm, [Pi]c, as a function of ATP hydrolysis rate, ATPase flux. The three curves correspond to three different simulation conditions. Curve 1 is the prediction from the full integrated cell model; curve 2 is the prediction from the model without PI control on complex III; curve 3 is the prediction from the model with matrix PI concentration clamped. The circles represent an experimentally measured estimation from Jeneson et al. (Jeneson, J. A. Ph.D. thesis, 1992). Wu F, Yang F, Vinnakota KC, and Beard DA. 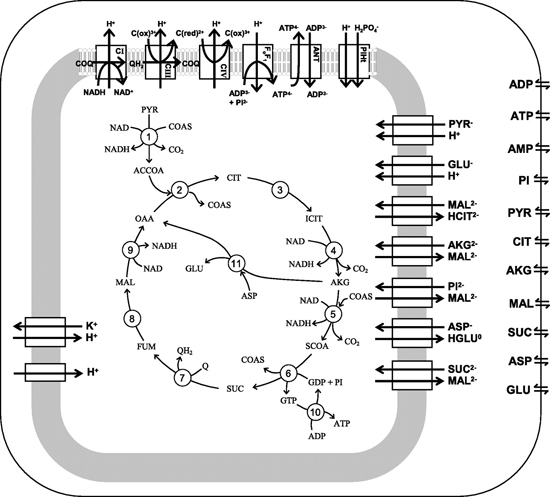 Computer Modeling of Mitochondrial Tricarboxylic Acid Cycle, Oxidative Phosphorylation, Metabolite Transport, and Electrophysiology, Journal of Biological Chemistry, Vol. 282, No. 34, pp 24525-24537, 2007.